The European Council will hold an extraordinary summit in Brussels on 25 November to finalise the UK's withdrawal agreement, council president Donald Tusk has announced. "If nothing extraordinary happens, we will hold a European Council meeting in order to finalise and formalise the Brexit agreement," Mr Tusk said, a day after the 585-page withdrawal agreement was approved by the British cabinet. "It will take place on Sunday the 25th of November at 9:30am." Mr Tusk said Brexit was a "lose-lose situation" for the UK and EU and sent a message to the British people: "As much as I am sad to see you leave, I will do everything to make this farewell the least painful possible, for you and for us." "I hope that there will not be too many comments," he said. Welcoming the approval of the draft agreement by Theresa May's Cabinet, Mr Tusk said: "Of course, I do not share the Prime Minister's enthusiasm about Brexit as such. 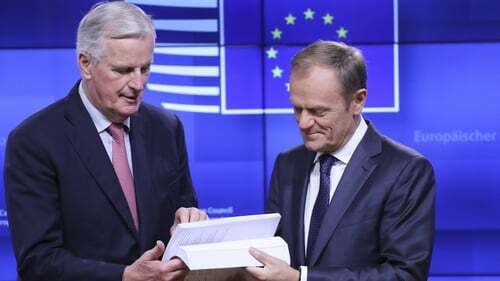 Thanking Michel Barnier for his work as chief negotiator, Mr Tusk said: "You have achieved our two most important objectives: You ensured the limitation of the damage caused by Brexit and you secured the vital interests and principles of the 27 member states and of the European Union as a whole." In a message to the British people, Mr Tusk said: "As much as I am sad to see you leave, I will do everything to make this farewell the least painful possible, both for you and for us." Mr Barnier formally delivered the 585-page draft agreement to the European Parliament this morning. Q&A: What happens next in the Brexit process? It comes as British Prime Minister Theresa May yesterday secured cabinet support for her draft Brexit deal, after a five-hour meeting with ministers at 10 Downing Street. Mrs May said she believed the draft agreement was "the best that could be negotiated". The draft Withdrawal Agreement aspires to address the unique circumstances on the island of Ireland, maintaining North-South cooperation, avoiding a hard border and protecting the Good Friday Agreement. The 585-page treaty contains a 33-page Protocol on Ireland, involving 21 articles and four annexes. The Protocol envisages a single backstop involving a UK-wide customs arrangement, with specific provisions for Northern Ireland regarding the rules of the single market and customs union. The backstop can only be superseded through a joint agreement by the EU and UK. The Withdrawal Agreement does justice to the whole idea of unscrambling 43 of UK membership of the European Union. From an Irish point of view, the most important element is the Protocol. Just over one year into the transition period that starts at the end of March, the EU and UK will assess how to avoid a hard border. There will be three options: the future free trade agreement, an extension of the transition, or a backstop in the shape of a UK-wide customs arrangement. There will be provisions to ensure that Northern Ireland remains aligned with the rules of the single market. While there is a promise not to impede the movement of Northern Irish goods to the rest of the UK, there will be minimal regulatory checks in the other direction, and these will be agreed through a Joint Committee of EU and UK officials. Northern Ireland will also apply the full European Union customs code, while a more basic customs union model will apply in the UK. Spain has set up contingency plans in case there is no final deal on Brexit, junior EU affairs minister Luis Marco Aguiriano has said. Mr Aguiriano added: "If the United Kingdom leaves without a deal, so does Gibraltar ... what we want is an orderly exit." The peninsula, a British territory since 1713, is a major point of contention in Anglo-Spanish relations.